Last summer I made Mexican stuffed shells for the first time. We all loved them but I wanted them to have a little "kick" to them. Both my husband and I love spicy food so I decided to make this recipe again for dinner but by adding a little heat to the dish. I used chipotle peppers and wow was this incredible! In a large skillet cook ground sirloin; add taco seasoning and prepare according to package directions. Add your black beans, chipotle peppers, and sour cream. Stir until well combined and set aside. 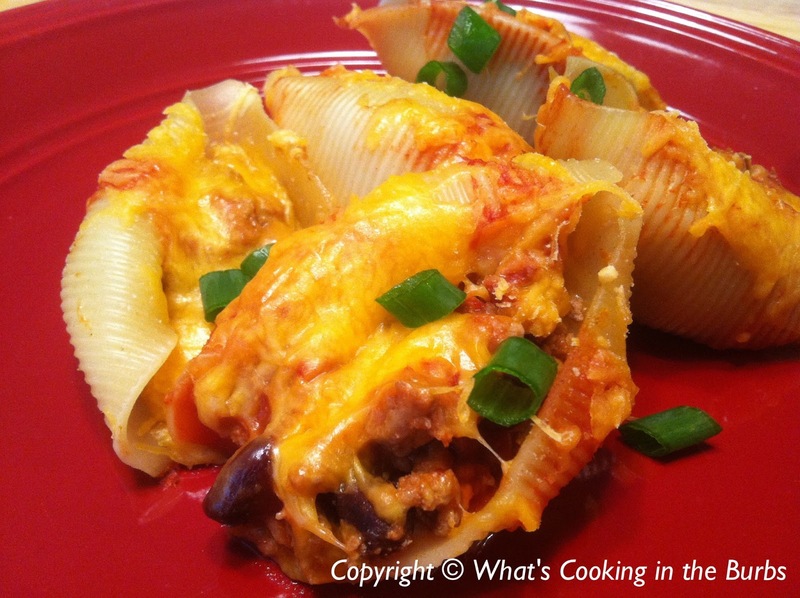 While ground sirloin is cooking, cook the pasta shells according to directions; drain. Set shells out individually on a cutting board or baking sheet. Pour about 2 tbsp. of salsa on the bottom of a 9×13 baking dish. Stuff each shell with the meat mixture. Place shells in the pan open side up. Cover shells with taco sauce. Cover with foil and bake for 30 minutes. After 30 minutes remove foil and add shredded cheese and bake for 10 more minutes. Top with green onions and serve with sour cream and/or more salsa. Enjoy! Looks delicious... looks like it needs a margarita! WHAT?! This is my two favorite foods - mexican and italian - mixed together! I think I MUST try this!!! I love chipotle chilies! YUMMM!! Thanks for sharing! Oh I made these last year! I love them yours looks so good!Thanks for sharing at Show Me Your Plaid Monday's! This looks great, Bridget ! Thank you for sharing at our ALL MY BLOGGY FRIENDS party :-) Please join us again on Tuesday!